A fine bird is more than fine feathers. A Jackdaw tried to make itself look pretty using peacock feathers. It had to flee when found out. What a rout. 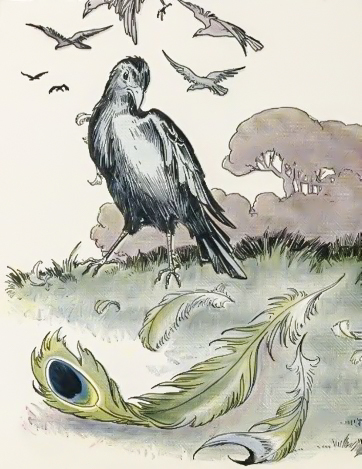 A Jackdaw found a number of feathers which had fallen from Peacocks when they were moulting. 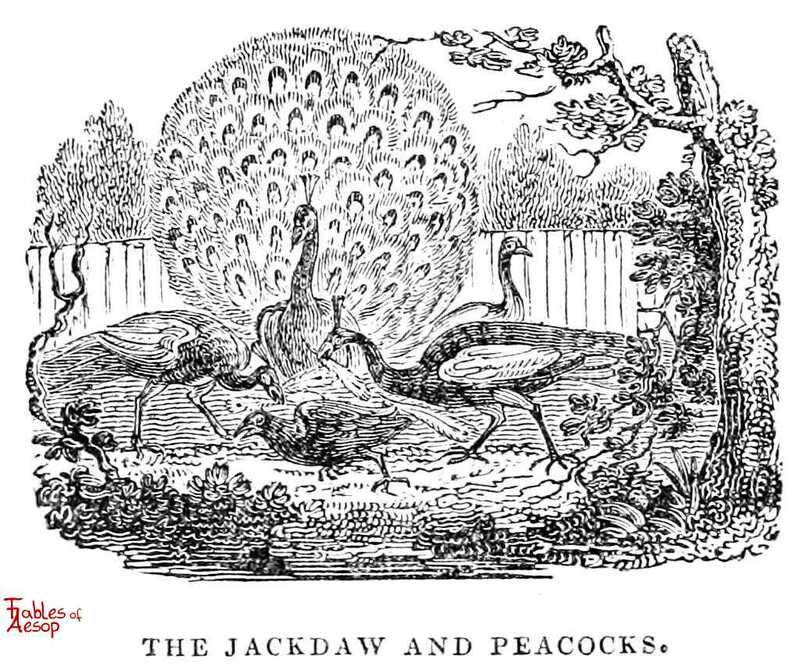 He tied them to his tail and strutted towards the Peacocks. When he came near them they discovered the cheat, and plucked away his borrowed plumes. The Jackdaw could do no better than go back to his companions, who had watched his behaviour from a distance; but they were equally annoyed with him for the deception. A Jackdaw having dressed himself in feathers which had fallen from some Peacocks, strutted about in the company of these birds, and tried to pass himself off as one of them. 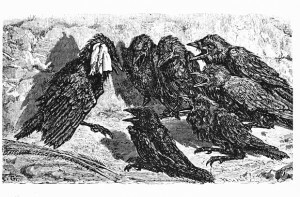 They soon found him out, and pulled their feathers from him so roughly, and in other ways so battered him, that when he would have rejoined his fellows, they, in their turn, would have nothing to do with him, and drove him from their society. 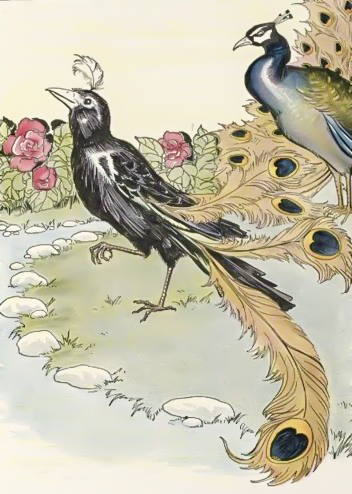 A CERTAIN Jack-Daw was so proud and ambitious, that, not contented to live within his own sphere, he picked up the feathers which fell from the Peacocks, stuck them among his own, and very confidently introduced himself into an assembly of those beautiful birds. They soon found him out, stripped him of his borrowed plumes, and falling upon him with their sharp bills, punished him as his presumption deserved. 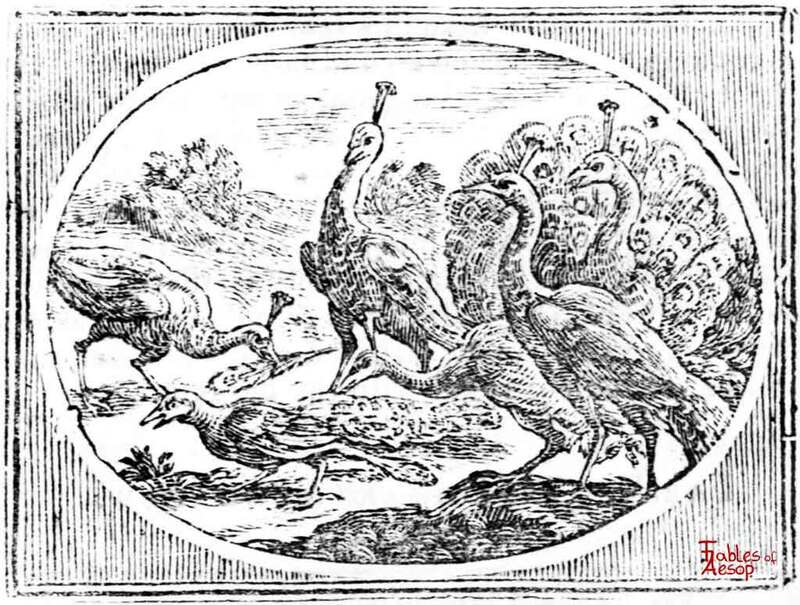 Upon this, full of grief and affliction, he returned to his old companions, and would have flocked with them again; but they, knowing his late life and conversation, industriously avoided him, and refused to admit him into their company; and one of them, at the same time, gave him this serious reproof. If, friend, you could have been contented with your station, and had not disdained the rank in which nature had placed you, you had not been used so scurvily by those upon whom you introduced yourself, nor suffered the notorious slight which we now think ourselves obliged to put upon you. What we may learn from this fable is, in the main, to live contentedly in our own condition, whatever it be, without affecting to look bigger than we are, by a false or borrowed light. To be barely pleased with appearing above what a man really is, is bad enough; and what may justly render him contemptible in the eyes of his equals: But if, to enable him to do this with something of a better grace, he has clandestinely feathered his nest with his neighbour’s good, when found out, he has nothing to expect but to be stripped of his plunder, and used like a felonious rogue into the bargain. A Daw that had a mind to be sparkish, trick’d himself up with all the gay-feathers he could muster together; and upon the credit of these stoll’n, or borrowed ornaments, he valu’d himself above all the birds in the air beside. 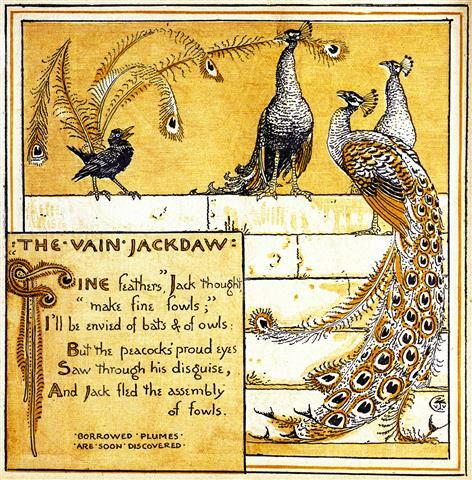 The pride of this vanity got him the envy of all his companions, who, upon a discovery of the truth of the case, fell to pluming of him by consent; and when every bird had taken his own feather; the silly daw had nothing left him to cover his nakedness. 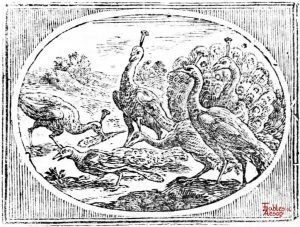 We steal from one another all manner of ways, and to all manner of purposes; wit, as well as feathers; but where pride and beggery meet, people are sure to be made ridiculous in the conclusion. 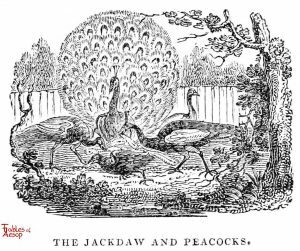 And Jack fled the assembly of fowls. Borrowed plumes are soon discovered.